The Coleman Red Canyon Tent is a cheap, 17 foot by 10 foot, dome tent - but is it good? Learn why Red Canyon 3 room, 8 man, family camping tents get mixed reviews. Privacy is important in 3 room family tents and with the humongous Red Canyon, both kids and adults get plenty of lounge room. However, equally as important is a family tent being waterproof and warm through three seasons. Sadly, this cheap family dome tent falls short on both of these important aspects, emphasizing the 'you get what you pay for' motto amongst campers. Overall though, there are positive aspects that make the Coleman Red Canyon 17-foot by 10-foot modified dome tent a perfect purchase for some families. The majority of consumers give positive reviews to Coleman Red Canyon Tents; however, they are quick to mention something negative, too. 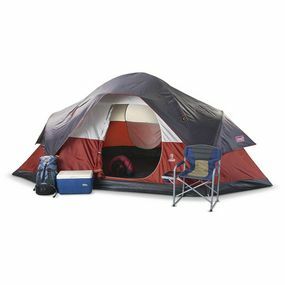 Coleman Tents know how to appeal to entry-level and budget oriented campers. This luxurious family tent for camping nails all vital essentials that consumers look for in a luxury tent. But are Coleman Red Canyon Tents reliable? The Coleman Red Canyon 3 room, 8 person tent is a luxury family camping tent that costs less than $100 when on sale (Check Amazon for the best price ). Few tents have so many amenities for such little cost. 3 rooms, 170 square feet, and 6 feet high ensures plenty of privacy and elbow room. Even better is that the privacy walls can be removed, allowing you to customize your space. Pitching a family dome tent within 15 minutes is a priceless feature. Thanks to shock-corded and color-coded tent poles, the Red Canyon shelter can be pitched by two people in a timely fashion. All these amenities are useful and essential aspects of a luxury shelter--but details make or break a family camping tent. The question is did Coleman fail to pay attention to details when designing the Red Canyon 17-foot by 10-foot dome tent? A selling point of family tents is an outdoor, screened lounge area, which the Red Canyon lacks. Not a deal-breaker, but something to consider. Also, Coleman Red Canyon Tents do not have the insulation necessary to make this a 3 season tent. This is a significant disadvantage as your investment can only be used 25% of the year. Since Coleman doesn't specify whether the Red Canyon dome tent uses aluminum tent poles or fiberglass, it is a safe assumption that fiberglass tent poles are used. Fiberglass is less reliable and less sturdy than aluminum, increasing the likelihood that they'll break during inclement weather. A useful feature of family tents is having multiple doors to allow all members to easily move in and out--unfortunately, the Red Canyon has only one door for entry and exit. Finally, and most importantly: Red Canyon Tents are not fully waterproof. The rainfly is poorly designed and does not cover all the seams. This means that your family will get wet if it rains, which can ruin a camping vacation. The Coleman Red Canyon 17-Foot by 10-Foot, 3 room, 8-Person Modified Dome Tent is spacious and cheap. Like everything in life, you get what you pay for--while some consumers have found that the Coleman Red Canyon Tent meets all their camping needs perfectly, its varied reliability and Coleman's refusal to disclose the tent pole material means it cannot receive a top rating. Have you been using Coleman tents? Share your Coleman tents review and let us know how it worked for you! Coleman Tents - Reviews & Ratings - Go back to the web's most comprehensive collection of Coleman Tent reviews. 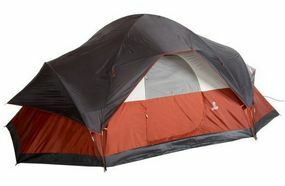 Coleman Weathermaster Tent Reviews - Elite 4, 6 and 8 Models - These are Coleman's flagship tents. Read our reviews to learn why we love them and highly recommend them. 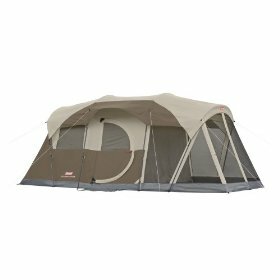 Coleman Bayside Tent Review: Elite 6 & 8 Person Family Shelters - Do NOT buy this tent--unless you want to sleep in a waterbed. Coleman Sundome Tent Reviews - Lots of people don't like this tent. Read our thoughts.